Henry Rankin Poore paints himself in the center of the pack of artists running after the fox, stylishly dressed in a striped suit and checkered knickers. 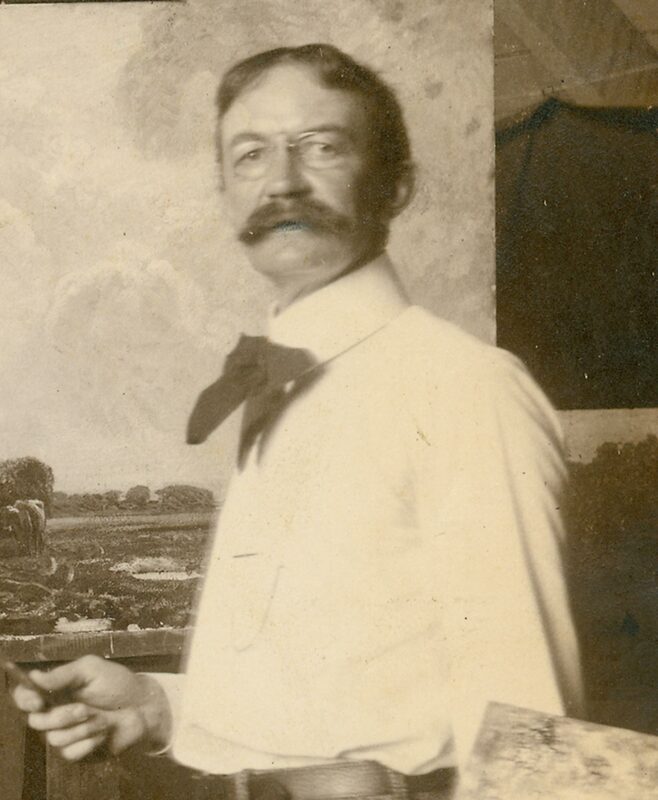 The son of a prominent clergyman, Poore was converted to the world of art after seeing a painting in the Centennial Exposition in Philadelphia in 1876. After studying art in New York and Philadelphia, Poore traveled to the American southwest to illustrate Pueblo Indians for the government. He later traveled to France and England to round out his artistic studies. 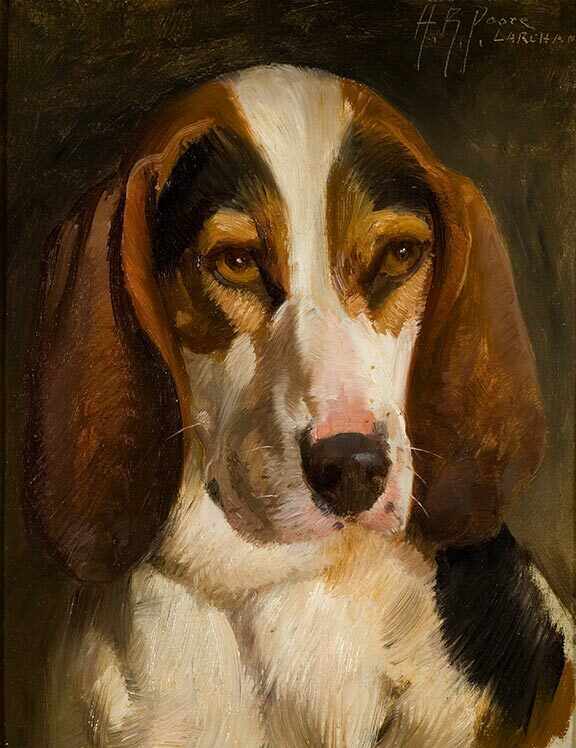 It was in England that Poore began his lifelong interested in fox hunting, a sport that would inspire much of his painting and writing. 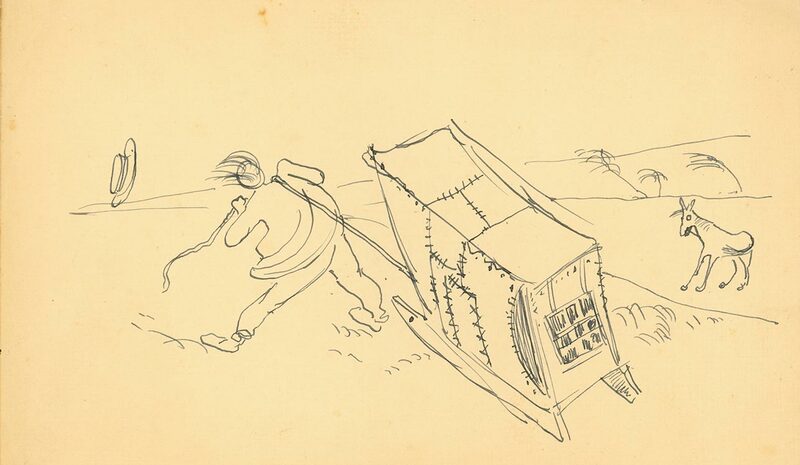 Interestingly, by the time Poore arrived in Old Lyme and began his comical version of a fox chase over the dining room fireplace, there was already a set of English prints depicting a foxhunt hanging on the wall. Poore began The Fox Chase in 1901, and continued painting it through 1905, with minor additions years later. It quickly became emblematic of the exuberant camaraderie enjoyed by the Lyme colony artists and was a draw for tourists and visitors to Old Lyme. Here, in wild chase over the hills, are depicted all the members of the Holy House contingent, where some fifteen of our best artists, each recognizable at a glance, are shown, each in characteristic action. Some with lusty strides, kits on their backs, follow the chase. 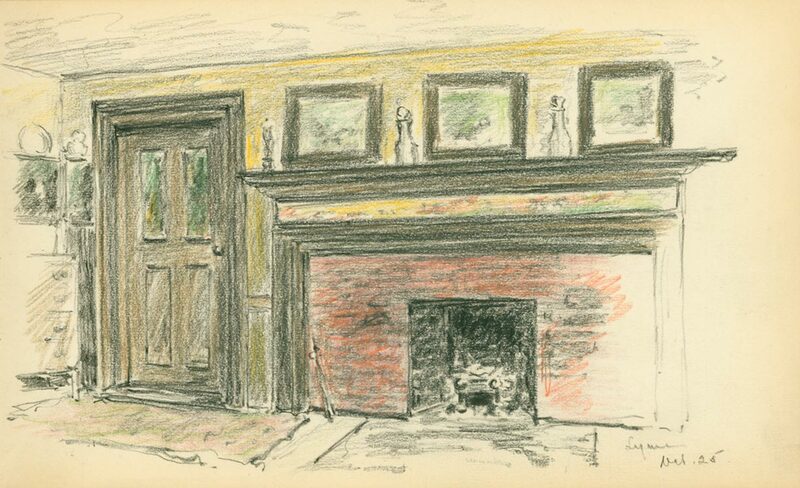 Poore was one of the first artists to come to the Griswold boardinghouse in 1900. 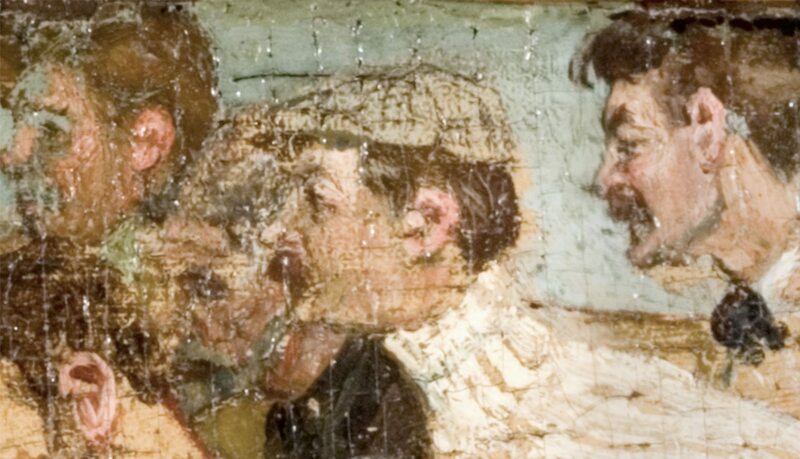 Both he and Henry Ward Ranger began to leave their mark by painting pictures on the door panels — a practice inspired by the country inns of Europe where artists often stayed. The first of the painted doors was actually a collaboration between the two. Ranger painted a scene of the wooden Bow Bridge behind the Griswold House and challenged Poore to complete the scene. 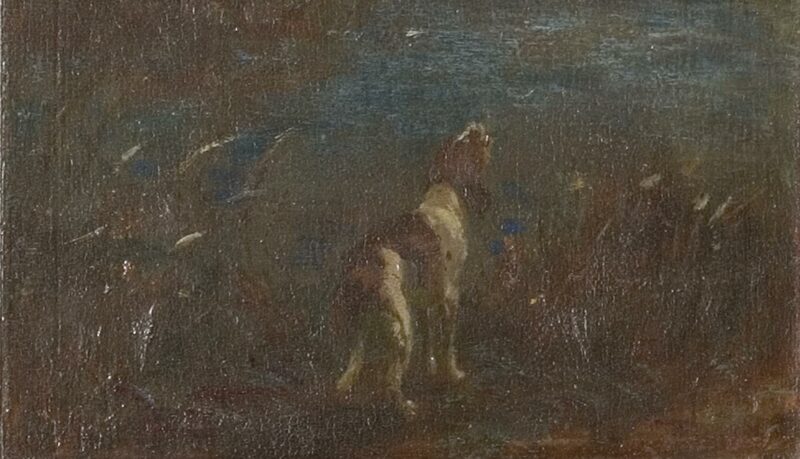 Poore matched the style and color perfectly in a painting showing his dog howling at the moon. 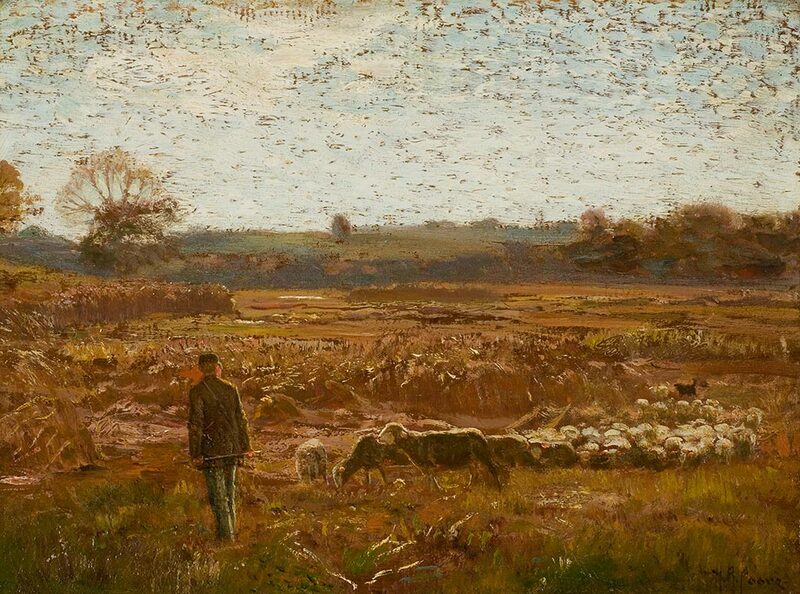 Poore painted the Lyme landscape with year-round passion. In order to paint comfortably in winter, Poore constructed a portable studio set on runners that could be pulled by four oxen (less if there was snow) to the desired spot in the landscape. The studio had a plate-glass window on each side and double floors that were covered with heavy woolen rugs. Designed by Poore, the studio featured an oil stove, hinged seats, and built-in racks and shelves for drying paintings and storing artist materials. A true animal lover, Poore was always accompanied by his faithful hound dog, and often a woolly sheep that could serve as a ready-made model.